GDC Notebook: Day 2: Al Gore in Deadwood, Super Mario What? A second day of the Game Developers Conference ended sometime in the blurry evening several hours ago. The day had started pure of heart for me—a panel of game developers lobbying for the creation of romantic video games—and ended with the bang of corporate spectacles for massive and/or noisy new games. 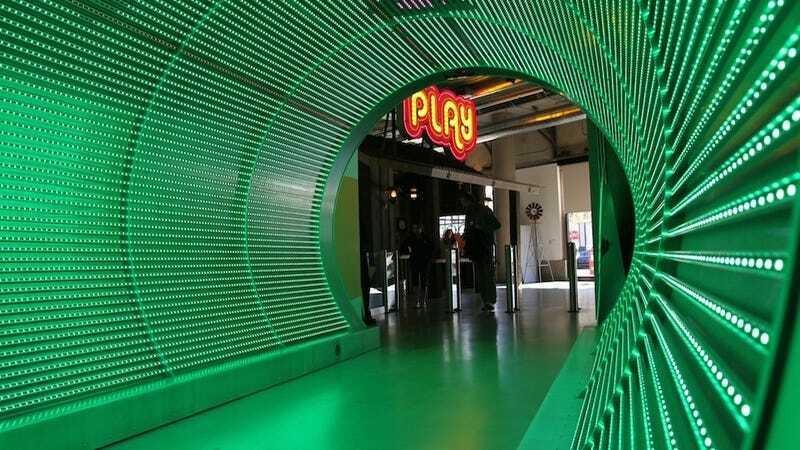 In the middle of the day, I left the area of San Francisco where they're holding GDC to visit Zynga, that company behind FarmVille and most other popular Facebook gaming obsessions. More on that later, but up top, you're looking through a tunnel on the ground floor, out to their entrance. I have trouble attending any convocation of game developers without stumbling into former EA developer Chris Hecker and a new chance to play his always-in-development asymmetrical two-player game Spy Party. He was stationed in the suite of Braid's Jonathan Blow for an evening session with his game. I'm still a better spy than a sniper. I wasn't supposed to get to this suite demo, because there were EA events running during it. But when EA events go bad, this is what you do. It feels right at GDC... flee the corporate stuff; find the indies. The first EA event was the debacle, showing that you do not follow a smart, strong presentation about Sim City by Maxis' Lucy Bradshaw with endless on-stage chitchat between a gaming reporter and a) the director of An Inconvenient Truth, b) the co-founder of Twitter and c) whoever-talked-third-but-I-left-by-then. EA clearly wanted to pitch this new Sim City as a responsible, civic-minded connected game that lets players have fun while encountering real world environment and economic problems (probably why they left the details of the game's super-hero and super-villain lairs out of their presentation), but it made for a night of Twitter mockery since, well, more than hour of not talking at all about the game at a supposed reveal for a new game is a bit much. Lowlight: the host reporter, struggling to get Truth director Davis Guggenheim to say anything that would interest the crowd of game reporters, recalls Guggenheim's work for an HBO western and says, "If you had to cast Al Gore as a character in Deadwood, who would you cast him and what would be his signature curse?" Flustered, Guggenheim declined to answer. The second EA event, for the new Medal of Honor and Battlefield was more successful, particularly when they let the game developers speak about the games and not people who don't make games. There's promise in this new Medal of Honor: Warfighter, though at first it appears as generic and expected as they come. I'll have more on that later, but, yes, I snickered when the game's producer, mentioning the series' move from its Taliban/Al-Qaeda theater in 2010, announced to the crowd, "We are pulling out of Afghanistan this year..." And there I thought we were talking about games, not politics. Day 2 was the day I encountered one game developer who only just saw Star Wars and thought Darth Vader was lying to Luke Skywalker in Empire Strikes Back and another game developer who confessed that they didn't know Super Mario Bros. well enough to have a conversation about it. Wii U chatter was mixed on day 2. A financial analyst told me Nintendo is screwed. Not enough time to be out on their own. A developer told me their fortunes are mixed. Good ambition on Nintendo's part, but, well... it's Nintendo, everyone says it's on Nintendo for the thing to succeed. Same as it ever was. It's almost all on them.